A new image from the Atacama Large Millimeter/submillimeter Array (ALMA) of the forming star system L1448 IRS3B reveals three protostars and a spiral structure in the system's disk of dust and debris. The image covers an area about eight times the size of Earth's solar system. For the first time, a litter of newborn stars has been spotted emerging from the same disk of gas and dust, creating a tightly packed stellar family. The data, from the Atacama Large Millimeter/submillimeter Array (ALMA) in Chile and the Very Large Array (VLA) in New Mexico, supports a theorized process in which the whirling disk of gas and dust around a forming star, called a circumstellar disk, splits up to form orbiting companion stars. "This new work directly supports the conclusion that there are two mechanisms that produce multiple star systems — fragmentation of circumstellar disks, such as we see here, and fragmentation of the larger cloud of gas and dust from which young stars are formed," John Tobin, a researcher at University of Oklahoma and Leiden Observatory in the Netherlands, said in a statement. Tobin is lead author on the new work, which was published today (Oct. 26) in the journal Nature. On the left, an artist's concept shows the triple star system forming from the disk of material orbiting a newborn star. On the right, a view of how the mature star system might orbit. The forming star system is called L1448 IRS3B, and it's 750 light-years away from Earth in the constellation Perseus. 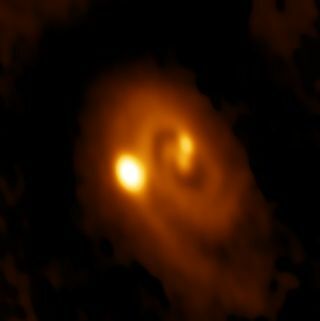 Although the system's three protostars share an origin, they are not identical: The bright protostar at the center has one companion separated by 61 times the distance from Earth to the sun, and a third protostar circles out on a spiral arm in the dust cloud, at 183 times the Earth-sun distance. Combined, the two central protostars likely match the mass of the sun, and the third has a minimum mass of 0.085 times the sun's, the paper said. "This whole system probably is less than 150,000 years old," Kaitlin Kratter, a researcher at the University of Arizona and co-author on the work, said in the statement. "Our analysis indicates that the disk is unstable, and the most widely separated of the three protostars may have formed only in the past 10,000 to 20,000 years." A view from the Very Large Array, showing light with wavelengths of 8 millimeters, reveals the three stars forming in L1448 IRS3B. The disk's spiral structure, and the hierarchical pattern of the protostars — with one forming close to the central star and another farther out — supports the idea that they formed via gravitational instability, collapsing all at once out of the dust, the researchers said. This is similar to a suggested model for how some large gas giants form around newborn stars. Protostars are much cooler and lower-mass than mature stars, and they can appear very close together — making them challenging to discern from far away. Only recently have arrays of radio telescopes been sensitive enough to spot multistar systems' early days. "This complicated structure was revealed thanks to the 10-times-higher sensitivity and two-times-higher resolution provided by ALMA compared with previous observations," Adele Plunkett, a researcher at the European Southern Observatory in Chile who was not an author on the study, wrote in a News & Views piece accompanying the new paper. "Fragmenting disks like the one observed by Tobin and colleagues are probably not rare — rather, they are waiting to be studied in more detail using the powerful (sub-)millimeter-wavelength telescopes that are now available," she added.